Seed fairs are a special type of voucher system, whereby a temporary market is set up to allow for small-scale farmers to access quality seeds at subsidized prices through the exchange of vouchers. These types of fairs usually only last for one day. The main objective of seed fairs, or for other types of agricultural inputs, is to ensure access to agricultural inputs for vulnerable, food-insecure or crisis-affected farmers and seed producers. 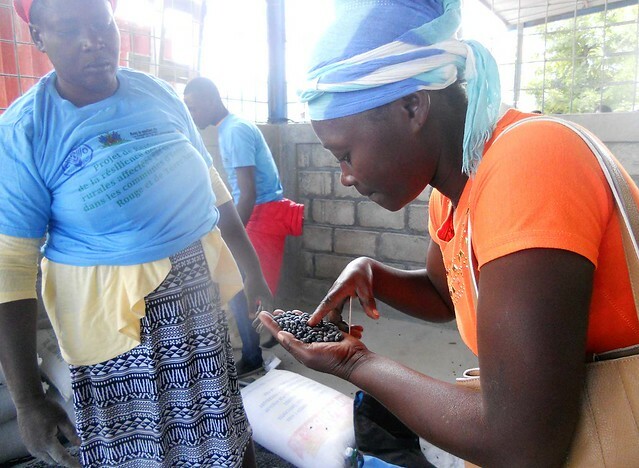 This was indeed the objective of the seed fair organized on 23 March 2017 in the commune of Ennery, in Haiti’s department of Artibonite that has been particularly affected by repeated episodes of drought along with poor distribution of rainfall. Nearly 900 farmers have traveled to Ennery to purchase certified quality seeds. FAO’s partners, in collaboration with a targeting committee set up by the technical and administrative authorities, select seed suppliers in a transparent manner who can sell at seed fairs. Priority is given to local seed producers, partners of FAO, and producers/vendors of the same commune. Their registration as vendors is based on the quality of their seeds, following verification by FAO agronomists to check for specific purity and of varieties, germination rate, sanitary condition and moisture testing. Priority is given to suppliers of fast maturing and drought tolerant seed varieties, such as Béséba, a local variety of Lima haricot bean. Partners organize information/training sessions on the methodology and objective of seed fairs for community-based organizations, technical and administrative authorities, and for seed vendors. During these sessions, the location and date of the seed fair are established. Today, nearly 900 farmers will be able to purchase three seed pots (9 kg). They’re all there, and everything happens calmly, the crowd is patient, despite the high number of participants. The partner begins with an explanation of the fair’s objective, highlighting the added value and quality of seeds. Each beneficiary receives vouchers valued at HTG 1500 (USD 22) that they exchange for seed types and varieties of their choosing. The vendors are then paid by the partner, either at the end of the day or the next, upon presentation of the vouchers. Seed fairs allow for both vulnerable households to choose the types and varieties of seeds that are cultivated in their area, as well as to improve the economic situation of seed producers/vendors of the same commune, thus encouraging them to continue engaging in their activities.